Wide variety of insects on sale at a local market in northernThailand. While insects can be slimy, cringe-inducing creatures, often squashed on sight by humans, a new book released today by the Food and Agricultural Organization (FAO) says beetles, wasps and caterpillars are also an unexplored nutrition source that can help address global food insecurity. The book, Edible Insects: future prospects for food and feed security, stresses not just the nutritional value of insects, but also the benefits that insect farming could potentially have on the environment and on addressing the rapidly increasing demand for food worldwide. While the idea of eating a worm, grasshopper or cicada at every meal may seem strange, FAO says this has many health benefits. Insects are high in protein, fat and mineral contents. They can be eaten whole or ground into a powder or paste, and incorporated into other foods. “Insects are not harmful to eat, quite the contrary. They are nutritious, they have a lot of protein and are considered a delicacy in many countries,” said Eva Muller, the Director of FAO’s Forest Economics, Policy and Products Division. Although they are not staples of Western cuisine, insects currently supplement the diets of some 2 billion people and have always been part of human diets in Asia, Africa and Latin America. Of the 1 million known insect species, 1900 are consumed by humans. Some of the most consumed insects include beetles, caterpillars, bees, wasps, ants, grasshoppers, locusts and crickets. According to the book, which was launched today at the Forests for Food Security and Nutrition conference, taking place through Wednesday at FAO headquarters in Rome, farming insects for human and animal consumption is particularly relevant at a time when population growth, urbanization, and the rising middle class have increased the demand for food while simultaneously harming the environment that enables its production. Insects on sale alongside other delicacies in northern Thailand. By 2030, over 9 million people will need to be fed, along with the billions of animals raised annually for food and as pets. Meanwhile, land and water pollution from intensive livestock production and over-grazing are leading to forest degradation, thereby contributing to climate change. The production of greenhouse gases by insect farming would likely be lower than that of livestock. For example, pigs produce 10-100 times more greenhouse gases per kilogram than mealworms. Insects also feed on bio-waste, use significantly less water than livestock, and can be farmed more easily, the book states. Insect farming could also offer important livelihoods to people in rural areas as minimal technical or capital expenditure is required for basic harvesting and rearing equipment. Their high nutritional value and relative ease of en-masse production will not be enough to make insects part of people’s dishes all over the world, and FAO knows this. She added that Western countries, most notably in Europe, have also been recently expressing interest in incorporating insects into their cuisine. A common misconception of insects as food is that they are only consumed in times of hunger. However, in most instances where they are a staple in local diets, they are consumed because of their taste, and not because there are no other food sources available. Insect trading is thriving in cities such as Bangkok and Kinshasa, and there is high demand from urban consumers. In such places, insects often arouse feelings of nostalgia for the rural countryside. In other cases, insects are seen as a snack. The book stresses that there is still a long way to go before insects can be universally incorporated into both human and animal diets. Mass-production technologies need to be perfected, potential allergies to certain species need to be explored, and legislation must be enacted on insect farming. The food industry, including industry professionals and chefs, must also help raise awareness about insects’ potential as food to increase the level of acceptance among consumers. “Although it is unrealistic to see families in the West eating insects for their Sunday lunch within the next decade, the potential of insects is huge and we hope that slowly but surely this potential will be realized,” Ms. Halloran said. 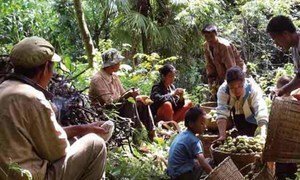 The crops, animals and trees found in forests can play a crucial role in improving food security and nutrition around the world, according to the United Nations Food and Agriculture Organization (FAO), which is hosting a gathering on the issue in Rome next week.